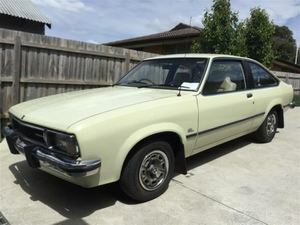 4/78 UC Hatchback Torana.The car is in excellent condition for age with only a couple of minor spots of rust and I included the 3 photos of rust spots I could find, I would call it 99%. There is a tiny bit under hatch window( have a look at the photo, its hard to spot) and both doors have a small amount of surface rust under the door at the front, its not visible and easily fixed without respraying the whole dooors( plan was to fix it while still using the car)The interior is immaculate for nearly 40 year old car, but the temp and fuel gauge dont work at the moment( have not looked into it), the heater is all hooked up and fan is working but there is no hot air coming out.Mechanically seems no problem as I recently drove it over 1000km with no issue, it is a fairly healthy 202 6 cylinder with Trimatic auto transmission. The odometer is working and showing 158000km which judging by the condition of the interior could be true milage. Tyres are very good and its fitted with LX Hatch and SLR hubcaps in excellent conditionThe car has a very rare dealer fitted Holandia roll back sunroof, people who know sunroofs know how good this company is( rolls royce of sunroofs to this day) which is in fantastic condition and no leaks.It is also fitted with a luggage rack on the hatch from the dealer, not everybodys taste but it attracts plenty of looks as you dont see many of them.